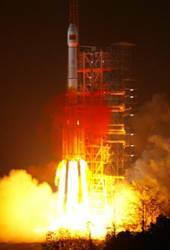 China successfully launched another Compass satellite into geostationary orbit from the Xichang Satellite Launch Center in southwestern Sichuan province at about 0:12 a.m. Beijing Time on Sunday (January 17). Russia got its GNSS program back on track on December 14 with the launch of three modernized GLONASS-M satellites — resuming a schedule interrupted by problems with a navigation payload on an in-orbit spacecraft. Problems with a navigation payload on a recently launched GLONASS-M satellite appear to have become a greater cause for concern for Russian Federal Space Agency (Roskosmos) than previously expected, leading to a further delay in a scheduled September 25 launch until next February. Chinese- and English-language versions of a draft Interface Control Document (ICD) for China’s Compass open service signals have been written and will probably be released within a year, a speaker at the Stanford PNT Symposium said in an October 22 presentation. The U.S. Air Force successfully launched the last in the series of eight modernized GPS (IIR-M) satellites today (August 17) at 6:35 a.m. (EDT). Using the Space Launch Complex 17A at Cape Canaveral Air Force Station, Florida, the satellite was carried into space aboard the last of the Air Force’s United Launch Alliance Delta II rockets. GPS IIR-21(M) will join the constellation of 30 operational satellites on-orbit, assuming a position in plane E, slot 3 and replacing space vehicle number 40 (SVN40). The Air Force expects to set the satellite healthy for navigation users worldwide next month. 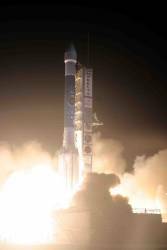 The scheduled August 17 launch of GPS satellite IIR-(21)M — also known by its space vehicle number SVN50 — will mark the end of a couple of eras: the final launch of the Lockheed Martin–built replenishment generation (Block IIR) of GPS satellites and the last Air Force launch using the Delta II rocket. Notably, SVN50 will not have a payload connected to the J2 reserve auxiliary payload port that proved problematical with the L5 demonstration payload on the previous GPS satellite, SVN49, and possibly on other Block IIR/IIRMs. 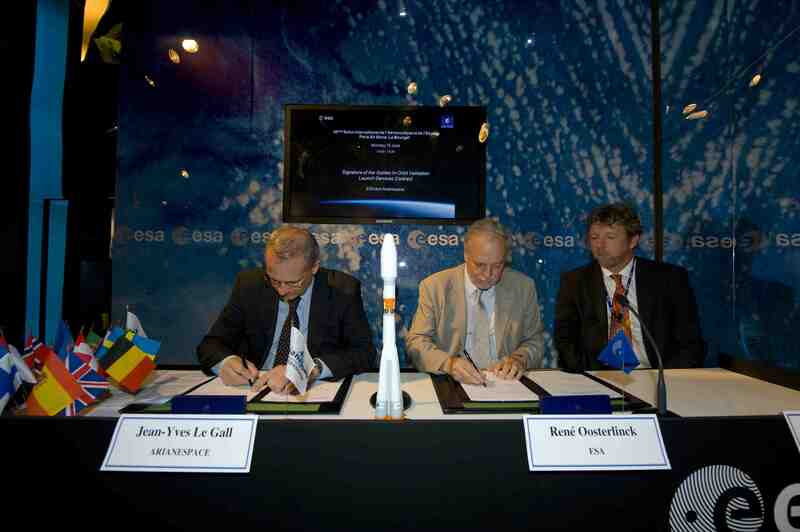 On June 15, the European Space Agency (ESA) signed contracts for launch services on the Galileo in-orbit validation (IOV) satellites as well as two additional contracts for “long lead items” needed to build the full operational capability (FOC) Galileo constellation of satellites. The first contract, with Arianespace, will provide launch services for the four IOV Galileo satellites that will be placed in orbit by the end of 2010. 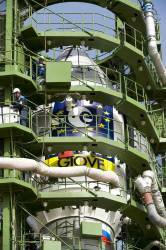 Two Soyuz rockets, each carrying two Galileo spacecraft, will launch from Europe’s Spaceport in French Guiana. Block IIR-20(M) launch from Cape Canaveral. Photo by Carleton Bailie, United Launch Alliance. 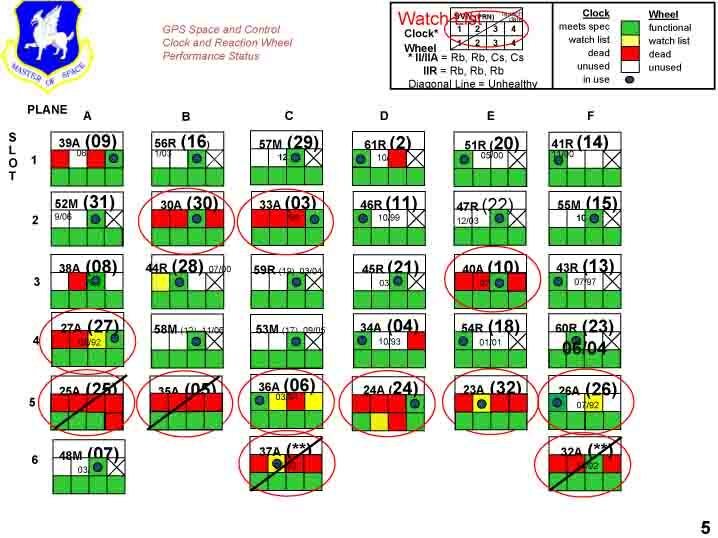 GPS program managers and users — especially the U.S. civil aviation community — can breathe a sign of relief following the successful launch Tuesday (March 24) of a satellite carrying a demonstration payload of the new L5 signal. 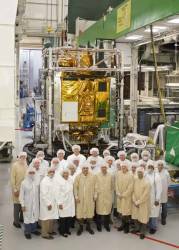 Built by the Lockheed Martin Company, the modernized Block II replenishment spacecraft, GPS IIR-20(M), is moving toward plane B, slot 2 to replace space vehicle number (SVN) 30. If all goes well, U.S. Air Force controllers expect to set the satellite healthy for navigation users worldwide next month. Among other signals and capabilities, the IIR-20(M) will be the first to transmit the new GPS civil signal centered on 1176.45MHz (±12 MHz) within the protected aeronautical radionavigation service (ARNS) band. This so-called L5 signal will provide a second safety-of-life signal that meets the technical requirements for enabling aircraft to make precision landings in high multipath environments. After a series of rescheduled launch dates, U.S. Air Force (USAF) officials have placed the final two GPS Block IIR-M satellites on “indefinite” status, pending the replacement of ordnance timers used in the Delta II launcher. GPS IIR satellite. Lockheed Martin photo. 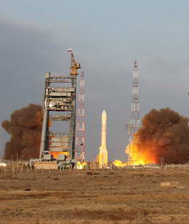 A new generation of GNSS signals will become available soon as Europe’s second Galileo In-Orbit Validation Element satellite (GIOVE-B) reached orbit, following successful launch on Sunday (April 27) from the Baikonur cosmodrome in Kazakhstan. Riding a Soyuz/Fregat launcher, the 500-kilogram (1,100-pound) spacecraft lifted off at 12:16 a.m. Central European Summer Time (CEST). The Fregat upper stage performed a series of maneuvers to reach a circular orbit at an altitude of about 23,200 kilometers inclined at 56 degrees to the equator. The two solar panels that generate electricity to power the spacecraft deployed correctly and were fully operational by 5:28 CEST. The European space Agency (ESA) operational schedule called for Galileo signals at three L-band frequencies to begin transmitting within seven to eight hours after reaching orbit, according to Giuseppe Viriglio, ESA’s director of telecommunications and navigation.